Lifelong enjoyment: that’s the goal here. You want to be healthy and happy at the best weight you can maintain for the rest of your life. Thanks to THE DIET FIX that’s absolutely possible. Honestly ask yourself if you can eat the way you are eating forever. Are you hungry? Do you wish you could have that piece of chocolate? Ask yourself if you are happy with your current exercise length and intensity level. You may be, but for a lot of dieters—they know they can’t sustain unhappy actions. Freedhoff begins with a history of various diet programs and moves on to something I found interesting: the sings of dieting, the traumas of dieting, and the Post Traumatic Dieting Disorders (PTDD). He finds why certain diets don’t last, labels the pitfalls of remission, and categorizes the emotional effect of a stumbled journey. The solution, or fix, is the bread and butter of the whole book: the 10-Day Reset. 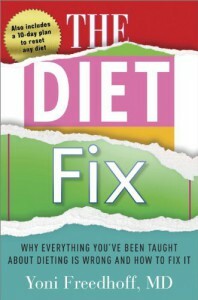 The end of THE DIET FIX contains reset techniques for specific diets, as well as well-supported advice for everyday life situations. Really, you could probably move forward on the first half of the book: knowing the psychological, physiological, and hedonic behaviors toward dieting, and especially the 10-Day Reset. However, if you are inclined to follow any other diet plan, Freedhoff has techniques for success with that plan. Freedhoff also includes considerations for everything else, from work conferences to vacations, and even parenting. The walkaway advice seems simple, yet logical enough to last a lifetime. For that, I’m giving this five stars.